From the seat of his tractor cab, Bob Magstadt has a good view of the snow falling steadily onto a Baxter neighborhood in central Minnesota. 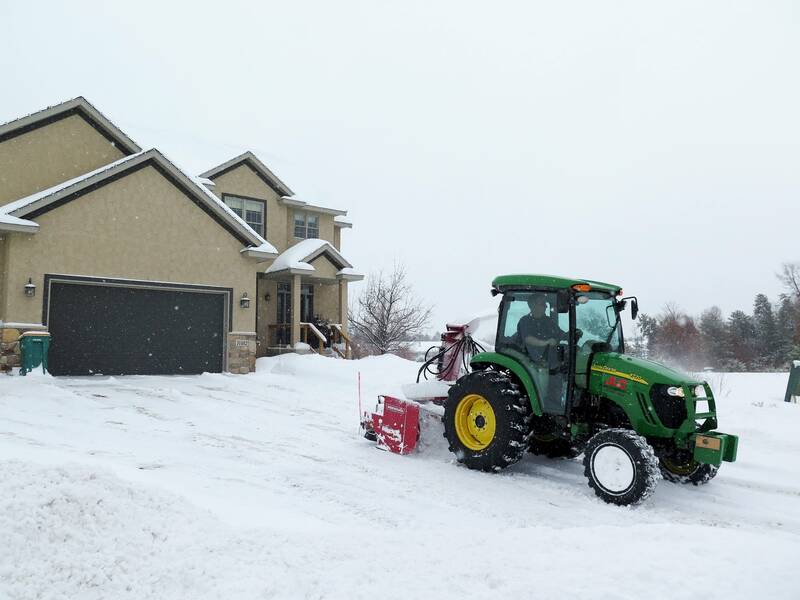 With a hefty snowblower attached to the back of the tractor, he's clearing snow from the driveways of a long line of town homes. "Every few days, we're out and at it," Magstadt said. "In December, [business] didn't look good until the end of the month. But it's looking good now." Magstadt is an office manager for a small snow removal business, Jared's Lawn Care, that mostly clears driveways for residential customers. This winter, he's been spending a lot of time in the cab. "We've got two tractors that stay busy full time," Magstadt said. 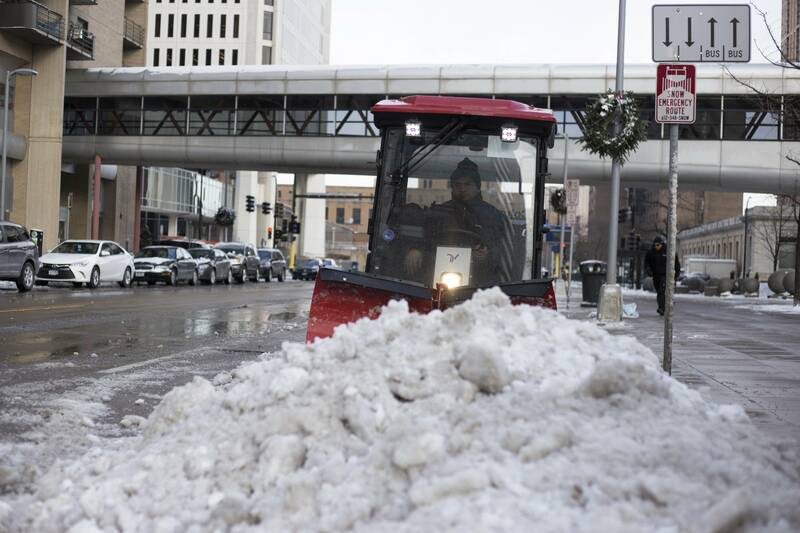 For Minnesota's public works departments and private snow removal companies, this winter's record-breaking precipitation has meant brisk business, long hours and trying to figure out what to do with those piles of snow. Mike's Tree Company handles snow removal for about 120 customers in the Brainerd area — mostly businesses, churches, schools and hospitals. Mindy Serocki, who handles office marketing, said the company's crew of about 20 employees has worked steadily for the past few weeks — and they're tired. "It's been pretty consistently every day," she said. "When we do have downtime, they're out scraping and cleaning and salting and turning around and prepping for the next round." The snow may be good for business, but Serocki said their employees still have to come in to start equipment and answer the phones even when schools are closed and temperatures are well below zero. "You can't complain. It's the nature of the game," she said. "Personally, I'm just tired of it because we've still got to get in here no matter what the roads look like to get the job done." The heavy volume of snow this winter also has meant long hours for city public works departments with limited staff that sometimes struggle to keep up. In Brainerd, city engineer Paul Sandy said just seven snow plow drivers clear all the streets and alleys. "They're getting a little tired of being out and plowing every day," he said. "There's other duties that we do during the winter that have taken a back seat to keep the streets clear. So it has been a challenge." Sandy estimates there's almost 40 inches of snow on the ground around the north-central Minnesota city already. It's getting tough to see around those huge piles at intersections, and the streets are narrower. "As we get more and more, the plows can't push it back far enough without having a lot of weight behind them to try to get that snow pushed way back in the boulevard," Sandy said. "Then we run into problems with covering sidewalks up. So it's kind of a Catch-22." • Related: Are there eco-friendly alternatives to road salt? It does help that the month of December was drier than normal, said Lisa Cerney, deputy public works director for the city of Minneapolis. "We had a lot of space starting here in January and February," she said. "But we are continuing to push the snow to the sides of the streets, clear the bike lanes and sidewalks. And it's starting to pile up." If these long days of clearing snow continue, some public works departments will start going over budget. Some public works officials say they're trying to plan schedules around the snowstorms so their drivers don't rack up too many overtime hours.